Over the past few weeks I have been trying to thin out my daughter’s massive collections of books and stuffed animals. (I have to do this very sneakily, since each item I attempt to get rid of is “MY FAAAAVORITE! !”) Through this process, I noticed that many of her stuffed animals are actually book characters. So, today I have just a few suggestions for using stuffed characters as an opportunity to for kiddos to do something “hands-on” during therapy. Skippyjon Jones is a Siamese cat who thinks he is a Chihuahua. 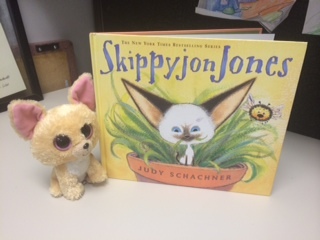 This ever growing series of books by Judy Schachner currently features 6 titles, which include the original Skippyjon Jones, Class Action, Lost in Spice, Skippyjon Jones and the Big Bones, Skippyjon Jones in Mummy Trouble, and Skippyjon Jones in the Dog House. Each story features Skippyjon’s adventures as he tries to be a dog. The books are available here, but you can also watch videos of each book being read here (it’s free!!). Scholastic also offers a lesson plan about diversity that could be adapted for the speech room. 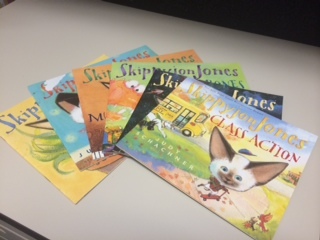 The Skippyjon Jones website includes several downloadable worksheets that may be useful for therapy as well as a curriculum connections guide for teachers, and several other lesson plans and activities that could be adapted for therapy. Another option would be to practice following directions with the “dress up Skippyjon” game included on the website. If you choose to use a stuffed Chihuahua/Siamese cat with this lesson, kiddos could practice following directions and demonstrate understanding of positional words by manipulating the stuffed animal. If you have kiddos who are working on more basic following directions goals, they could use the stuffed animal to mimic what Skippyjon does in the book (ie “make Skippyjon Jump”). Another option would be to practice comparing and contrasting using this worksheet featuring a Chihuahua and a Siamese Cat. This is good because it can be fairly simple or more complex depending on the needs of the specific student. Finally, if your kiddos are working on using context clues, you could use this worksheet to go along with the original book. I’m sure we all know this hungry old lady. 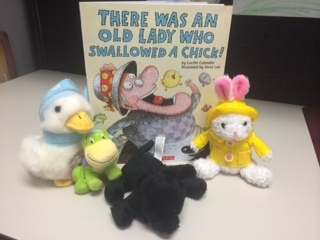 While there are multiple versions of this story in which the old lady swallows any number of non-edible items, the one I happen to have is There was an Old Lady Who Swallowed a Chick. In this version the old lady swallows the following: a chick, an egg, some straw, some candy, a basket, and a bow. Fortunately, many if the things she eats are household items and I was able to find all of them around the house (as well as a few extras like the dog and frog, who aren’t mentioned in the text, but appear in the illustrations). With these items, kiddos can act out the happenings of the book. If you are super ambitious, you could enlarge a color copy of the book cover and cut a hole where the old lady’s mouth is. Then they could actually “feed” the items to the old lady. Another bit of fortune is that I am not the first person to recognize this book as a good therapy tool. The TPT store offers several paid and free activities to go along with it. Some of the free options include a sequencing activity, an open ended homework packet, a Cranium Cariboo Companion Game, a retelling activity, and Granny Says! (following directions) among several other freebies that can be found by searching “There was an Old Lady Who Swallowed a Chick” on the TPT store. These are just a few of the options I came up with while cleaning out the clutter at home. Do you “borrow” items from your own children/nieces and nephews/friends’ kids/etc. to use in therapy? What types of Items have you found to be the most useful? As a follow up to Melissa’s post from last week, I thought I would share with you some excellent places to find free audio books for kids. Storyline Online offers audio books for children. The options along with run times are listed on the homepage. A Story Before Bed offers several books for free but also offers a paid subscription. National Geographic Young Explorer is another great option if you are looking for nonfiction texts. If you have kiddos using switches, you can hook up a switch to the USB on your computer so the child is able to advance the pages via the switch. FarFaria is an app for Ipad and Iphone but the catalogue of books is listed online. There is a paid option available, but you can choose one book to read per day for free. Does anyone use audio texts for therapy? If so, do you have suggestions for resources? Happy Friday…and a long weekend to boot! I am super excited to share today’s post! After struggling to make the transition from EzEdMed to EzTrac, Melissa Powell has implemented a system that helps her keep her notes up to date as well as having some unintended benefits as well! Today, she is sharing her method! Don’t you wish that you could suspend time to get just an extra 4 or 5 minutes to write therapy notes after each session? Just a few quiet minutes where you aren’t transporting kids to/from, dealing with behavior or feeling guilty over using therapy time to log? I’ve piloted something this year that, for me, has been the magic bullet. Rarely do I stay late logging or playing catch-up over the weekend…and to that, I say “Halleluiah!” In a brainstorming session on a visit from Kinsey Chambers, we came up with an idea that has allowed me to keep Medicaid logs up to date while keeping my kids engaged in a language activity. I’ve gone back to a bit of “old school” technology and am using a literacy listening center. During a session, I log my data (+/-) on paper, then take those kids back to class. When I pick up a group for the next session, the first thing they do when they come into my room is put on headsets and listen to a 3-5 minute literacy-based story. While the kids are listening, I log the notes from the previous group. I have a paper copy of the book, so that as soon as the story ends, we engage in a brief question/answer session about the book and use the pictures as cues. I can incorporate wh-questions, basic concepts (position/description/sequence), speech sounds, inferencing, comprehension, etc. The kids LOVE it! Even without watching a video or looking at the book, they sit quietly, entranced almost. I get 4-5 minutes to log, they start the session in a quiet, calm mood and we use this to jump into language based conversation around the literature. I’ve found that I don’t need any “speech” games at all during our “speech work” time. They haven’t missed them and are happy to jump right into work time. I feel my time is actually better utilized since I’m not using reinforcer activities. WIN-WIN-WIN!! What has amazed me is the depth of student engagement. I thought it wouldn’t work as well with my pre-K or self-contained kiddos. Wrong! They love it just as much. I will say, I did a good bit of “training” on what this should look like and am very careful to keep those standards strict during every session. I was also lucky enough to find several unused listening centers in the library AV storage room and even found a hanging rack for the headphones to keep everything neat and organized. One challenge was finding stories that are 3-5 minutes in length, are engaging and “make sense” even if they can’t see the pictures while they hear it. Many children’s books are so picture dependent that you can’t use your imagination to picture what is happening. I stumbled upon Robert Munsch books. He’s written a TON of them, they are all 3-6 minutes long, and on his website he reads all of them in a very dramatic and engaging voice. The bonus is that the kids have really engaged with him as an author and have made connections between books. I found about 20 different Robert Munsch books in our school resources/library. I plan to access some PTA funds to buy additional titles to use. I use 2 books a week, as most groups see me twice. Even when we’ve repeated them, the kids don’t mind. 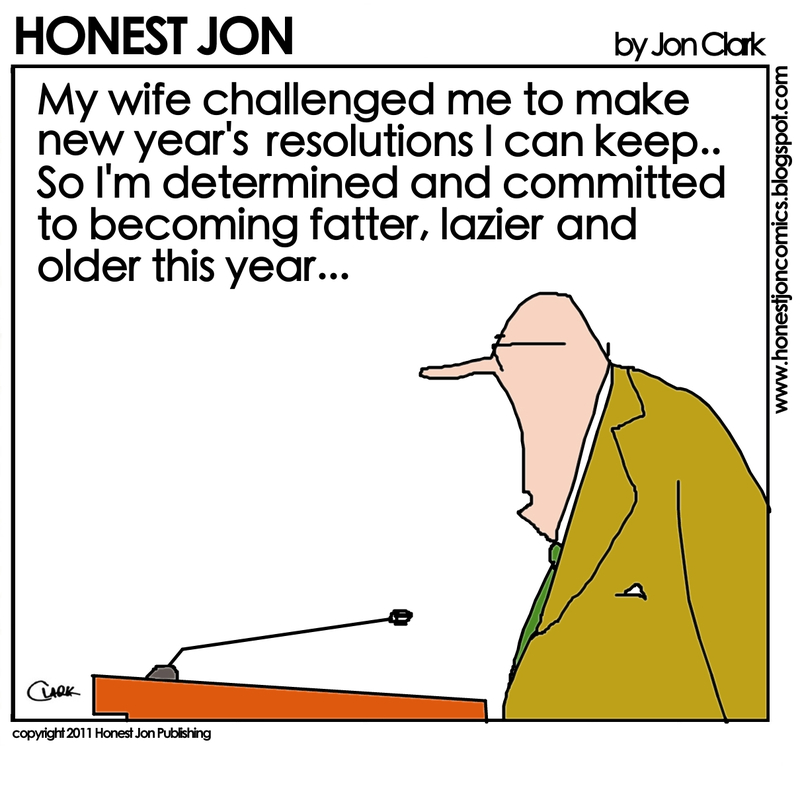 Are you in the habit of setting a resolution for the new year? As we begin 2015, it seems like an appropriate time to revisit the subject of goal setting. One way to approach this topic with your kiddos would be to look at existing IEP goals and progress. Allowing students to reflect on where they have been allows them (and you) to have a clearer vision of where they are going. If you used this form (or your own version) to discuss goal setting at the beginning of the year, now would be a good time to pull it out and review the goal as well as the progress they have made. If the student’s goal has changed since the beginning of the year, you could discuss why it changed and the new goal as well. It would also be a good time to allow the student to participate in their own progress report. While you are discussing goals and progress, you could allow the student to use this form to record their perception of how they are doing. This could be attached to the next progress report. What are your resolutions for the new year? How do you include student self-reflection within your therapy?